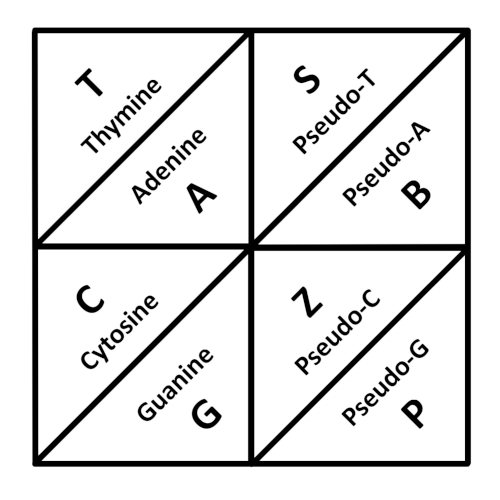 All life on earth uses DNA with four types of base molecules arranged in a “double helix” to encode information as sequences of Adenine-Thymine (A-T) and Cytosine-Guanine (C-G) pairs. 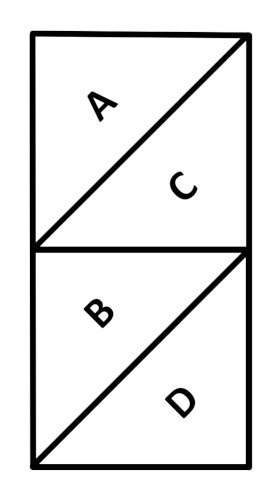 Because A pairs only with T and C only pairs with G, DNA can be split into two halves and then each half may be completed so that two double helices with the same information can be obtained. Nature also uses the “genetic code” to translate the information in DNA into specific amino acids via its molecular machinery that assembles proteins in the correct sequence. Now scientists have doubled the number of base pairs of DNA by adding four synthetic ones to the original four natural ones. Four new base molecules S (a Pseudo-T), B (a Pseudo-B), Z (a Pseudo-C), and P (a Pseudo-G) have been created so that S only pairs with B and Z pairs only with P. Now you have twice as many options as you had before and so this “hachimoji” (eight letter) DNA can have much greater information density. Plus if you re-engineer the molecular machinery to use these new bases you can have a brand new extended genetic code to build all sorts of synthetic proteins. These four riders famously make their appearance in the biblical book of Revelation, after the Four Living Creatures (essentially, the Tetramorph) say “Come” or “Allons-Y!”, depending on your translation. 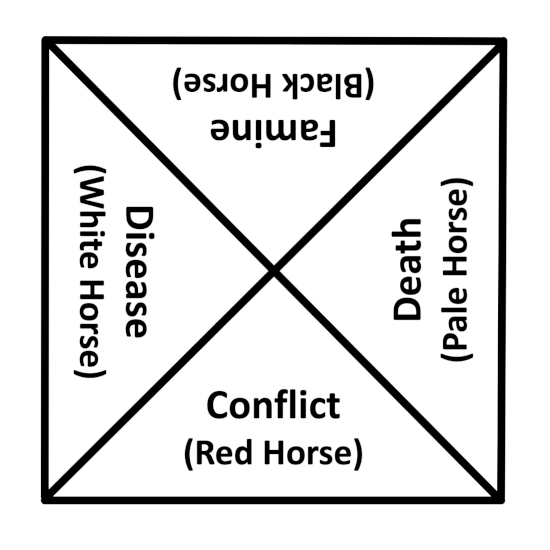 And indeed the Four Horse-persons are a powerful “meme” and are referenced in many popular entertainments and real-life derivative nomenclatures. I’m looking forward to the video series as I enjoy the main actors playing the “odd couple” of angel and demon, and after viewing the various trailers and photos. Who says Armageddon (or the struggle against it) can’t be fun? Ok, I admit it’s scary but sometimes you just have to laugh! Octonions are the fourth, the last, and the greatest of the so-called normed division algebras based on the Real numbers. When I first learned about the Octonions way back when, I didn’t like them because they weren’t associative like the Quaternions, the Complex numbers, and the Reals. But now I’m fine with that, and they may be important for new theories of physics! In addition, if any of the products like e2e3 = e1 are reversed you get the negative, so e3e2 = -e1. so it is hit or miss I guess. Also note that e7 = (IJ)K = -I(JK). And for all (eiej)ek and ei(ejek), if they are not equal, is one equal to the negative of the other? And do I have to multiply them all out to find out? The Quaternions are a number system that enlarges the Complex numbers, just as the Complex numbers enlarge the Real numbers. In fact, Quaternions can be thought as special pairs of Complex numbers, just as Complex numbers can be thought as special pairs of Real numbers. Quaternions can be used for all sorts of wonderful things, such as rotations in 3D space, instead of using matrices. 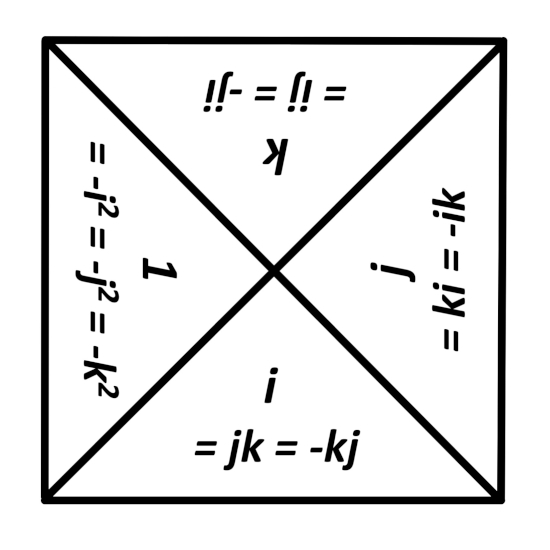 Above is a pitiful diagram (although better than my last one) of the Quaternion units 1, i, j, and k used in the typical representation a + b i + c j + d k. Please read about them in the links below and be amazed! Spiral Dynamics is an intriguing model for the different levels of development and interaction that individuals (and even cultures) may exhibit towards each other and the world. It has interesting parallels to Erikson’s Eight Stages of Psychosocial Development and even Leary’s Eight Brain Circuit Model of Consciousness. And maybe another, further step if we don’t destroy ourselves and the Earth by just being stupid. Erik Erikson developed an eight stage developmental model of the psyche for the full life of the human individual. 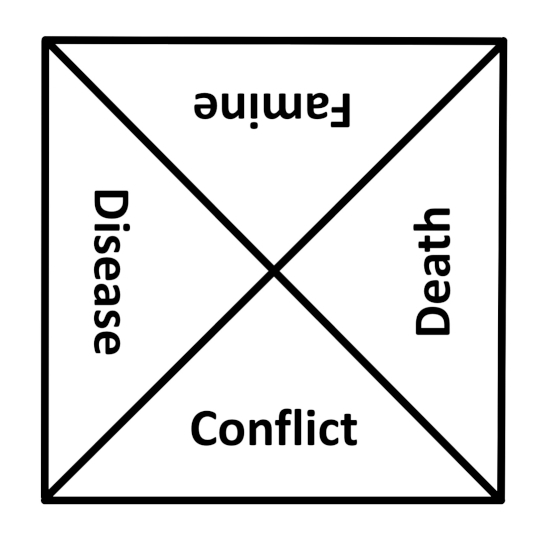 Each stage has a key conflict (with both positive and negative sides), its resolution into a “virtue,” and the typical age range for that conflict. I would think that these ages would depend significantly on cultural norms. 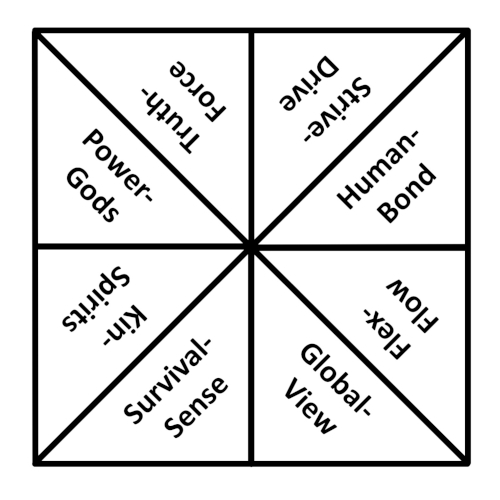 After my last post about an ad-hoc eightfold metaphysics, I spent a few minutes trying to create an eightfold psychology. Feeling insufficient to the task, I quickly put this aside and instead wondered if there was any prior work for this, and lo and behold, I found a wealth of such things. Eight seems to be a popular number for the enumeration of the psyche and related subjects. I’ve already mentioned Robert Plutchik’s Emotions and Mihaly Csikszentmihalyi’s Flow, which are both sort of psychological dissections. 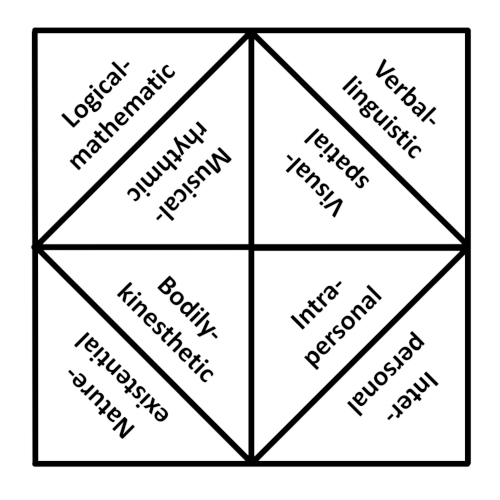 If you’re into Jung and related psychologies, Jungian analyst John Beebe developed his eight-function model of personality types that blends Jungian concepts together into an interesting system. 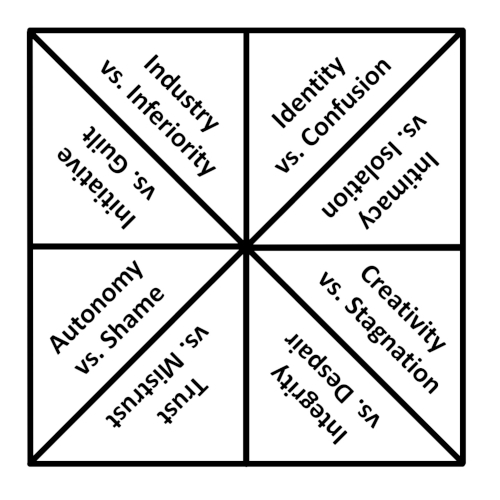 The eight types are split into two sets of four: for every type in the first “positive” set (ego-syntonic) there is a corresponding type in a “shadow” set (ego-dystonic). 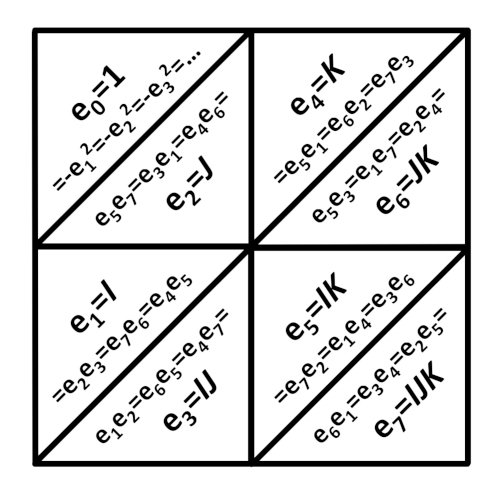 Each set of four has a superior, an auxiliary, a tertiary, and an inferior function. In my diagram, I’ve shown each function paired with its shadow function. And of course being Jungian, the terminology is full of gender distinctions, which could fairly easily be eliminated. There are also lots of arcane associations to MBTI and such, so this will take more than a quick look. Please just wait here, and I’ll be back with an update soon (or not)! 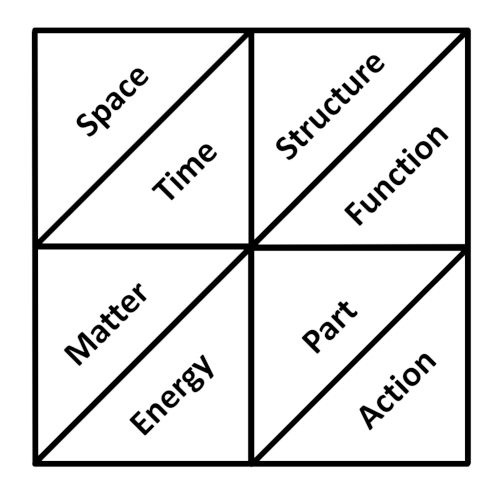 If one juxtaposes the fourfold Space-Time-Matter-Energy with the fourfold Structure-Function-Part-Action, one sees that there are several relations between them. These are simple common-sense relations, not modern-physics types of relations. Below they are listed by Space-type relations and Time-type relations. Space is required for the extension of Structures. Parts in an arrangement make up Structures. Structures extend and are organized in Space. Matter is located in Space. Time allows the expression of Functions. Energy is required for the operation of Functions. Actions in a sequence constitute Functions. Functions have duration and reoccur in Time. Energy requires and is dependent on Time. Actions take place within Time. Several analogies are also evident in this diagram. 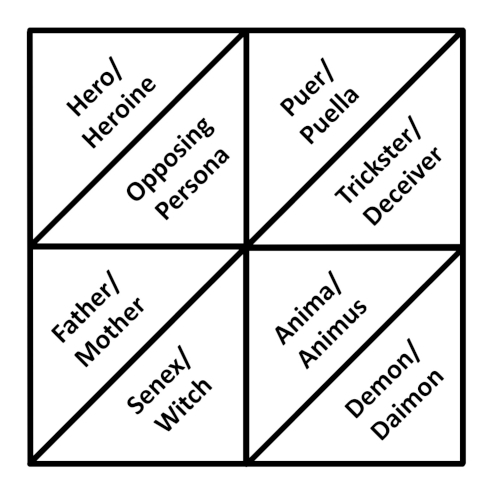 I suppose that any analogy could be shown in a figure like the one on the right (or even written as A / B // C / D) or with the two squares side by side, and that sets of four or six analogies that overlap could be nicely shown as above. If so, I wonder what can be gained by such representations? Probably individually not so much but with overlaps I think it would be interesting. The study of parts and wholes relations is called Mereology.